The opening ceremonies to Podcamp and Workcamp Hawaii were, put simply, the very best opening to any *camp style unconference to date. 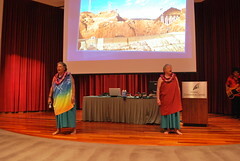 The morning started out with two traditional Hawaiian chants (called ʻoli) done by two local sisters, Haunani and ʻIlima Kauka, of Aloha Blessings. The first chant was asking for permission to be here, to be able to do what we were going to do. The second, was a chant of welcoming. Both were equally beautiful. After that we were treated to a hula dance by Kanoe Miller (pictured above). 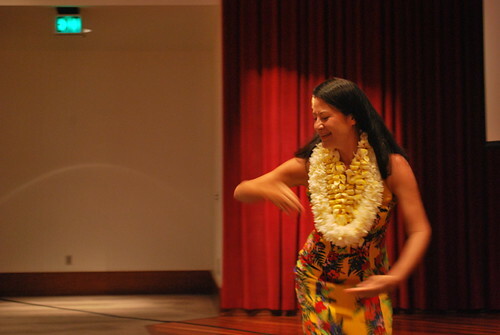 For those of you that have never seen a hula, I recommend catching Kanoe's dancing at the Halekulani Hotel. Hula is a dance that is done to a mele, or chant / song, that helps to dramatize the mele. Kanoe's dance was beautiful and I can not wait to see another Hula in the near future. I dare any other Podcamp or Wordcamp to try to top this opening ceremony.